The CQRE [Secure] conference provides a new international forum giving a close-up view on information security in the context of rapidly evolving economic processes. The unprecedented reliance on computer technology has transformed the previous technical side-issue "information security" to a management problem requiring decisions of strategic importance. Thus one of the main goals of the conference is to provide a platform for both technical specialists as well as decision makers from government, industry, commercial, and academic communities. The target of CQRE is to promote and stimulate dialogue between managers and experts, which seems to be necessary for providing secure information systems in the next millennium. 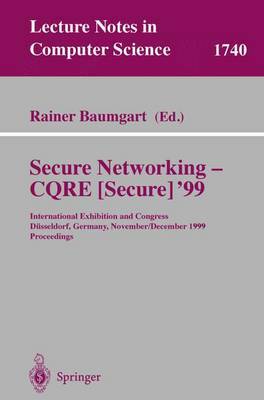 Therefore CQRE consists of two parts: Part I mainly focuses on strategic issues of information security, while the focus of Part II is more technical in nature. This volume of the conference proceedings consists of the reviewed and invited contributions of the second part. The program committee considered 46 papers and selected only 15 for full presentation. For the participants' convenience we have also included the notes of the invited lectures and short workshop talks in this volume.